(Boston, MA) SpeakEasy took some risks in putting up Men On Boats. Boston audiences are composed of plenty of folks that consider themselves liberal until it’s inconvenient. For example, Bernie Bros were all about feminism and other equalities until Hillary became a real threat. Then the silk gloves of human decency came off. Boxing gloves went on. MOB is the kind of show that will test its audience. The characters portrayed are real but the actors onstage do not strictly identify as men. There’s plenty of unlady-like and un-white-like behavior up there. It’s bound to ruffle some “erasing our history” feathers. In May 1869 John Wesley Powell (Robin JaVonne Smith) began a govt. approved expedition to officially map the Grand Canyon’s river. According to his journal’s, Powell and his men journey for four months from one end of the river to the other. Backhaus’s script examines how the winners write history, and how the marginalized are forgotten. It’s an ensemble piece that requires great imagination, fortitude, and patience. Believably portraying cis, white, hetero men is the least of the cast’s worries. John Wesley Powell was a disabled man. Wikipedia tells us, “…at the Battle of Shiloh, he lost most of his right arm when struck by a minie ball while in the process of giving the order to fire. The raw nerve endings in his arm would continue to cause him pain for the rest of his life.” As a member of the disabled community, it offends me that a consultant or dramaturg wasn’t called in to prep actress Smith on portraying a disabled character. If a disabled actress couldn’t be found, a consultant would at the very least be able to tell share the experiences of the disabled community with the cast and crew. According to the Men On Boats program, this was not done. Dramaturgical energies were spent elsewhere. To be clear: Smith is an excellent actress. She played Powell with respect and stalwart bravery. Playwright Backhaus fleshes her characters out; Powell’s depth isn’t defined by his disability. No, it is the fault of the staff for not ensuring that the entire cast wasn’t enlightened. Understanding the grave stigma against disability, or the limitations a man like Powelled faced in the 1800’s is basic research. That Powell would have lead a mission in “uncharted” territory is exceptionally bold for the time. That we must learn of the of Powell’s disability outside of the theatre is telling. Revisionist history, indeed. All in all, personal offences aside, Men On Boats, is a great production. The work is highly feminist. Backhaus attacks colonialism with brutal transparency. It would be a great companion to Thanksgiving dinner. The ensemble does excellent work with each other, and tackles the complicated staging by Simmons and Levine with dexterity. The shouted rhythms and step choreo is well executed. It’s a thorough if not entirely thoughtful production. 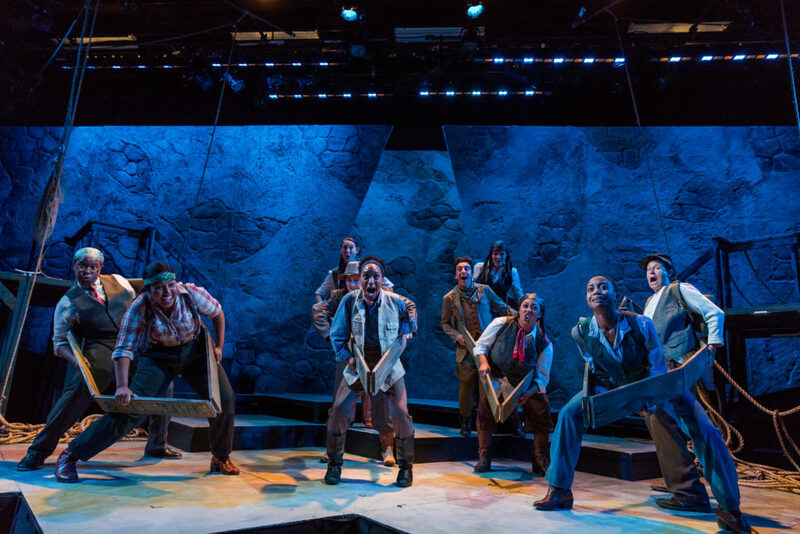 This entry was posted in Uncategorized and tagged 2017, Boston, Calderwood Pavilion at the Boston Center for the Arts, Dawn M. Simmons, Jaclyn Backhaus, John Wesley Powell, Kitty Drexel, MA, Men On Boats, Nile Hawver/Nile Scott Shots, Robin JaVonne Smith, Sloth Levine, Speakeasy Stage Company by Kitty Drexel. Bookmark the permalink.